Here we are back at our usual suite in New York City. We are getting a bit bored by the same old routine, and will be really glad of a change. We saw Roger, our boss, today and we will be going north soon but not until we have cleared up a lot of work here first. We have just been to a dance at the Statler Hilton Hotel, but it’s impossible to enjoy yourself, everything costs so much. To enjoy yourself in America costs a fortune. Also at dances the music is predominantly Latin American, which rather leaves us out of things. On Friday I had a letter from Dad and a letter from Mam. I was very sorry to hear that Mum has hurt her ankle, and quite badly by the sound of it. You must remember dear Mother that you are approaching your half century, and can’t go rushing around playing table tennis like a 15 year old!! I sometimes wonder when my dear Mother will begin to start even looking her age, let alone acting like it!! 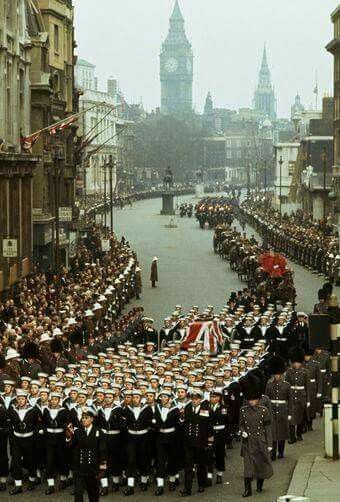 Sunday 31st January Yesterday (Saturday) we woke up at 8:30 am and turned on the TV and saw Winston Churchill’s funeral. Due to the time difference we first of all saw the end bit live via Telstar, and then saw tele-recordings of the whole thing, which had been seen live earlier. The whole day here was then devoted to tributes, and film of his life, and the funeral. Nevertheless it was a very moving and impressive to watch. Poor old London, it always seems to be raining there lately. Something very strange has been happening lately. It started every time I got out of the car. When I touch the door to shut it, I had a shock, and gradually it got worse and worse. I thought it was the car, but then I got shocks when I touched light switches and windows. The last straw came when I was opening our door with a key. When the key touched the lock there was a sharp crack and a huge spark!! However, yesterday I was relieved when Colin also produced a spark!! Last night at the dance I went to hand the man at the door my ticket, when I received the biggest shock of all, accompanied by a huge crack!!! Later, as we were leaving, we were in a crowd waiting for the elevator, when I heard a girl say to a fellow, ‘I’m keeping away from you, every time I touch you I get a shock’. So I spoke to him, and he has been having the same thing happening to him. So it’s not just me. I haven’t found out what it is yet – but it’s very strange. The weather here is bitterly cold, with temperatures down to 10 degrees F, but beautifully clear and bright, which makes it quite pleasant. I have begun to realise that without a central heating here we couldn’t survive. This afternoon we drove up to the Bear Mountains, and went to the Spring Mine Ski Centre. Skiing is very popular here and loads of cars have permanent ski racks on the top for carrying their skis. There were loads of people there skiing. It’s a wonderful sport and when we go somewhere further north, where it will be less commercialised, I would like to have a go. Now we are insured we can take the chance. The snow was very deep up in the mountains and it was very cold. A lake nearby had completely frozen, and hundreds of people were skating – and it all looked very picturesque. We had originally intended to go to The Bear Mountain Ski Resort to see the Ski Jumping Championships, but the traffic was so dense we changed our minds. We returned there later but the jumping was all over. We drove back to Manhattan and went to a very nice little place we have found to eat in Greenwich Village, and then decided to have a look around Chinatown. This is an area which is completely Chinese. Even the telephone boxes are Pagoda styled. They don’t seem to want English-speaking people there as all the signs and adverts are in Chinese. There was a supermarket and all the ‘bargains’ were in Chinese. Roger (Tony and Colin’s manager) has been staying at this Motor Lodge this weekend, and has had his daughter with him. He has given some mighty strange reasons for his stay here. We have come to the conclusion he has left his wife, and has his daughter for the weekend. It’s a bit of a nuisance as he phoned us early in the morning and expects us to get up for breakfast!! As you have no doubt guessed, we don’t!!! He may be the boss in the week, but on the weekend my boss is my bed!! Well I can’t think of any further news for you, so I will end now. PS what about the Evening Posts?